The month of September 2010 is not over yet and it is already one for the record books in terms of tropical cyclone activity. We have seen plenty of activity throughout the larger basin, in the tropical North Atlantic, in the Caribbean and in the Gulf. Tropical cyclone activity this September has offered a wide variety of storms, from major hurricanes, to a hurricane that made it all the way to Greenland, to a tropical storm that actually spawned its own “clone” (Matthew), to storms that decayed and almost dissipated only to be reactivated again (Julia, Lisa). Color-enhanced infrared GOES satellite view of Tropical Depression #16 ("Matthew the Clone") identified by the solid yellow outline as it mover in the northwestern Caribbean toward Southeast Florida and point beyond. Dotted yellow outlines identify other areas of disturbed weather and tropical waves that are active in the neighborhood of TD #16 and the western end of 'Hurricane Alley" approaching the Lesser Antilles. Projected track for Tropical Depression #16 on 28 September 2010 developed by the Navy Rsearch Laboratory based on data from NOAA's National Hurricane Center. As this post is being written “Matthew the Sequel” has become tropical depression #16 and it is moving north-by northeast toward South Florida and coastal regions beyond, in the Carolinas and up the eastern seaboard. Mosaic of composite satellite views on 28 September 2010 showing tropical cyclone activity and potential seeds for additional tropical cyclpne generation over the eastern Atlantic, equatorial Africa and the Indian Ocean. It would appear there is plenty of 'fuel' in the tropics to keep tropical cyclone activity in the larger Atlantic basin active over the next few weeks. 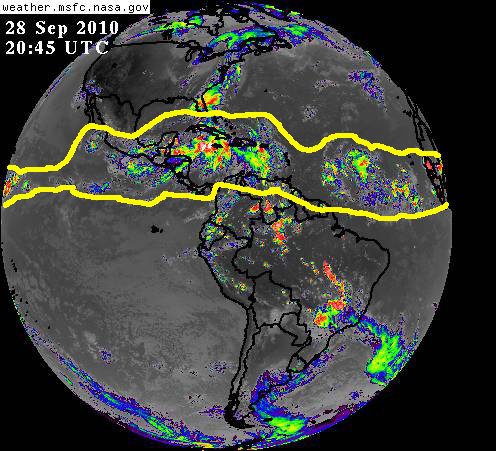 Looking east we see that ‘Hurricane Alley’ is already populated by a few tropical waves, some of which are looking rather threatening, and farter east over equatorial Africa and beyond over the Indian Ocean, numerous tropical waves of all shape and sizes continue marching westward to ride the ‘Tropical Wave Assembly Line” in Africa, which eventually may emerge over the eastern Atlantic and head in the general direction of the Caribbean, Gulf and USA Atlantic coastal regions. Full disk view of Earth's western hemisphere showing a portion of the tropical activity belt, which has been around the Earth for most of this 2010 Atlantic hurricane season. The question is: have we hit the peak of the 2010 Atlantic Hurricane Season or are we in for another burst of activity in October similar to what we have seen in September? Only time will tell what will have transpired in what remains of the 2010 Atlantic Hurricane Season, but for now we must concentrate in monitoring all these waves as they appear over the horizon, while being prepared. As we have said throughout this season, Pay Attention! Be prepared!! MITIGATE! !